A romance writer sets off to Colombia to ransom her kidnapped sister and soon finds herself in the middle of a dangerous adventure. Back when Romancing the Stone reached screens in 1984, it looked like little more than an obvious attempt to capitalize on the success of 1981’s Raiders of the Lost Ark. 32 years later, that’s still how I feel about it, as I don’t think the movie would have existed without Raiders to pave the way. However, Stone does enough differently to warrant examination on its own merits. Stone introduces us to Joan Wilder (Kathleen Turner), a successful romance novelist. Compared to her fiction, her real life seems much less exotic, as she lives alone and spends most of her time with her cat Romeo. She fantasizes about Jessie, the rugged protagonist of her stories. Joan’s life starts to become more complicated, though. Her sister Elaine’s (Mary Ellen Trainor) husband is kidnapped and apparently killed in Colombia and Elaine herself soon gets abducted. Ralph (Danny DeVito) and Ira (Zack Norman) orchestrate this abduction as part of a plot to find some unnamed archaeological treasure. More nefarious parties become involved as well when a mystery man named Zolo (Manuel Ojeda) kills Joan’s superintendent and ransacks her apartment. It turns out that Elaine’s husband Eduardo mailed her an alleged treasure map. Elaine tells Joan to bring it to Colombia to help save her life. This sets Joan on an adventure as she heads to Colombia. When she gets stranded in the mountains, Zolo corners her and demands her purse. Jack Colton (Michael Douglas) rescues her and becomes her guide for the carefully negotiated price of $375. The movie follows their relationship and attempts to stay alive along with other complications connected to the treasure map. Because I semi-slammed Stone as a Raiders wannabe, that may leave the impression it blatantly rips off the Spielberg classic. In reality, Stone riffs off the concept of Raiders and its tone more than anything else. 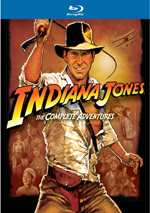 Unlike the Indiana Jones movies, Stone takes place in a contemporary setting and it presents protagonists who seem pretty different than those in the Indy efforts. Jack more closely resembles Indy than Joan compares to Marion. Jack is more of an opportunist than the studious Indy, but there’s still a common thread between them. On the other hand, there’s little to attach neurotic, flighty Joan to rugged, tough Marion. Sure, Joan gets more independent and stronger as the film progresses, but she’s a very different character than Marion. The two films connect mainly in their aspirations to present old-fashioned adventures, though even there they depart somewhat. Raiders favors action where Stone goes more for comedy and romance. It still includes plenty of fights and whatnot, but it doesn’t give us the unrelenting thrills of Raiders. This leaves Stone as more of a hybrid flick. It melds comedy, romance and action to create… well, I’m not sure what. I think it’s telling that although I was almost 17 when Stone debuted and thus part of its target audience, I barely remembered it until I watched it again on home video. I should have really liked it, but the fact that it maintained so little connection to my memory indicates that I must not have been too impressed. As I watch it again 32 years later, I can see why. Stone is perfectly watchable and has some fun moments, but I don’t think it ever coalesces into anything more. The flick’s lack of thematic focus creates some of these concerns. 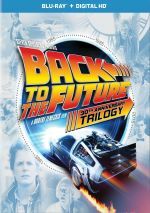 Director Robert Zemeckis did a much better job of melding comedy and action a year later with Back to the Future. In Stone, the combination of elements seems less winning. It suffers from “jack of all trades” syndrome, as it doesn’t do any of its sides terribly well. I can’t say I have major complaints about any of those elements; they just fail to move me. My main criticism of Stone relates to Alan Silvestri’s terrible jazz-pop-synthesizer score. His music dates the flick badly and makes it seem cheesy much of the time. 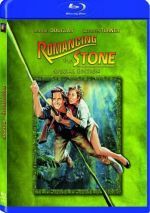 Romancing the Stone appears in an aspect ratio of approximately 2.35:1 on this Blu-ray Disc. Overall, I felt the image aged well over the last 32 years. Sharpness appeared positive, as the picture came across as crisp and detailed throughout the film. Only minor softness ever emerged in this tight presentation. Jagged edges and moiré effects weren’t an issue, and edge haloes seemed absent. As for print flaws, this was a surprisingly clean transfer. A few speckles popped up but nothing more significant than that occurred. Stone provided a naturalistic palette, and the disc replicated the hues accurately. With its jungle setting, greens dominated. The tones looked nicely clear and realistic, and they showed no signs of noise or bleeding. Blacks appeared reasonably deep and rich, while shadows were clean and concise. This was almost an “A”-level transfer, as it consistently looked very good. It looked better than I’d expect given its vintage. The DTS-HD MA 5.1 soundtrack of Romancing the Stone was decent but unexceptional. Given the age of the film, I didn’t expect a very active soundfield, and what I heard seemed adequate considering those restrictions. The mix favored the forward channels and created a reasonably engaging sense of atmosphere. Music showed fairly positive stereo delineation in the front, and effects popped up in logical locations. They blended together in a decent manner. The surrounds usually just reinforced the music and sense of environment, but they did provide some occasional unique elements, such as when a plane flew from front to back. Audio quality appeared acceptable. Speech seemed reasonably clear and distinct, and intelligibility never turned into a problem. Effects presented fairly clean and accurate material. Some distortion occurred – usually attached to gunshots and crashes – but those concerns weren’t significant. Music was rich and warm, with pretty solid low-end response. This track failed to stand out as memorable, but it worked fine considering the age of the film. How did the Blu-ray compare to the Special Edition DVD from 2006? Although the audio “upgraded” from lossy 2.0 to lossless 5.1, I didn’t detect significant improvements. The source material left this as a dated mix. Although I suspect the Blu-ray used the same transfer as the 2006 DVD, the format allowed for improvements. Color and definition showed the most obvious changes, and those allowed this to be a good step up in terms of visuals. The Blu-ray includes the same extras as the DVD, and we start with eight Deleted Scenes. These fill a total of 18 minutes, 58 seconds. We find “’Jack. T. Colton’” (2:13), “By the River” (4:22), “Keep Quiet” (1:47), “Treasure Map” (1:40), “Campfire on a Cargo Plane” (3:12), “’Romancing the Stone’” (1:03), “Alligator” (0:28) and “The Book Signing” (4:13). If fans hope to find gold in these clips, they’ll emerge disappointed. The scenes range from mediocre and tedious to simply useless. “Colton” goes a long way to throw out a minor character point, and the others add nothing particularly useful to the table. Many simply offer slight extensions on existing pieces, and none of them bring out anything positive. “Stone” and “Signing” are most interesting as they feature a male publisher instead of the character played by Holland Taylor. I’m not sure why “Signing” comes last, as it would have appeared early in the film. The absence of any commentary for the clips is a problem, since we don’t learn why this male actor got the boot. In any case, the “Deleted Scenes” don’t go much of anywhere. A few featurettes follow. Rekindling the Romance: A Look Back goes for 19 minutes, 47 seconds as it mixes movie clips, archival materials, and interviews. We hear from actor/producer Michael Douglas, Jewel of the Nile co-screenwriter Mark Rosenthal, and actors Kathleen Turner and Danny De Vito. We get information about the project’s origins and development, how Robert Zemeckis became director and his work on the set, casting, characters and performances, locations and related challenges, the particulars of some specific scenes, and reactions to the final product. I like that “Rekindling” includes all three of the main actors, and it does give us a decent overview of the production. I couldn’t call it a particularly rich documentary, though. The absence of Zemeckis from the proceedings comes as a disappointment and means we lack the filmmaker’s perspective. This is an enjoyable and moderately informative show but not a special one. Next we head to Hidden Treasure: The Screenwriter. This three-minute, 15-second piece presents notes from Douglas, De Vito, and Rosenthal, as they tell us a little about the late Diane Thomas. (She died in a 1985 car crash.) Don’t expect substance here. The show just tells us how she reinvented the genre and acts as an appreciation for her. No real information appears; it’s a tribute and not anything more. We get more from the main actors with the three-minute, 56-second Douglas, Turner and DeVito: Favorite Scenes. The three actors discuss various parts of the flick. 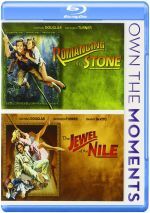 We get some praise from Jewel of the Nile director Lewis Teague and Rosenthal as well. Douglas, Turner and DeVito tell us which scenes they like and we watch them. A few decent stories come along the way, but not enough to make this an interesting show. The disc opens with an ad for Jumper. No trailer for Stone appears here.